← The 1992 Packers and The Buick LeSabre – Wait, What? No, no he isn’t. 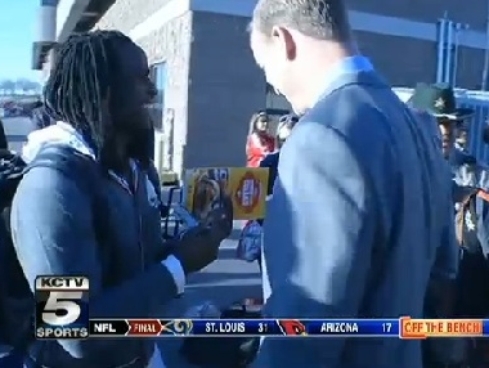 So Jamaal Charles asked for Peyton Manning’s autograph after the Chiefs v. Broncos game. So what. This tweet pretty much sums up the reaction of a lot of people. I laughed really hard when I read the tweet… it’s hysterical, but I don’t agree with it. Well, I don’t agree with the message behind it, which is “act like you’ve been there, you’re a fellow professional football player.” Sure, these athletes are millionaire studs, but they’re really not any different than us. They’re fans too. Not on the field…but after the game. Jamaal Charles was 12 years old when Peyton Manning became the starting QB for the Colts. That means he went through all of high school and all of college watching him dominate the quarterback position in the NFL just like I watched…from my couch. Let him get an autograph. Even if it wasn’t for his mom like he said it was… so what. Everybody just needs to calm the eff down. Moral of the story here is this… all you little bloggers out there, hoping to grow up and someday be as awesome as Lobshots… I won’t have any problem signing an autograph for you if we ever meet. Oh, do you guys remember that time that Donald Butler Almost Killed Jamaal Charles? I do. This entry was posted in Football, NFL and tagged jamaal charles, jamaal charles autograph, jamaal charles peyton manning, Peyton Manning. Bookmark the permalink.